Canales, V. (2005). 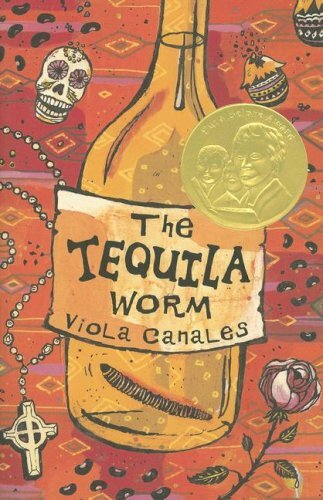 The tequila worm. New York, NY: Wendy Lamb Books. This is a 2006 Pura Belpre Award winner. I found this book to have a very slow start. It seems to take the reader methodically through each holiday and family Tradition without much depth. It is the story of a Mexican-American family, living in McAllen, Texas, and their traditions. I finally got hooked when Sofia began making the decision to go to a boarding school in Austin. I think it began to hit home for me, as I stayed back in Florida to finish high school when my family moved to Austin. I then went to the University of Texas at Austin and got to go home to visit all the time. My Papa (dad) was always so excited when I came home and also very proud of me. My family members had not gone to college before me. I was the first of many cousins who have now completed college. I had tears by the end of this book because I have also lived through the pale gray death of my father, the numbness that follows, and the fact that life must go on. I found the rich Catholic heritage of Sophia's family interesting too. My family is Catholic, but not Mexican-American. The Mexican-American families around me have such a rich heritage and tradition which is a wonderful thing. I found that this story answered some of my questions about those traditions. A good little book which exposes the reader to a young girl who wants to broaden her world.